I was diagnosed with autism as well as pica at age 2 and half years, then at 5 years old I was diagnosed enterocolitis which is a chronic bowel disease. I was also diagnosed with pica where I was eating weird and wonderful objects such as: plastic, wood etc. I didn’t speak until I was 6 and I only really started to – thanks to my older brother Aaron who was a massive help in enabling me to speak by repeating words over and over again so then it would stick into my head. Before I could speak my parents were told that I wouldn’t be able to speak at all when I was first diagnosed with my autism. With the enterocolitis side I was in and out of hospital and even schooled in hospital as well. Being in and out of hospital affected my education in my early life. I was very lucky as during my time in hospital one of my school teachers would visit me after they finished teaching for day and gave some of the teachers at the hospital some advice on how I should be educated. At the age of 10, I was fitted with an ACE stoma, during which they fitted a tube and they fed medication into my bowel, but unfortunately that didn’t work. I got very poorly and had a number of anaphylaxis episodes due to the medication. I now have to carry and adrenaline injection with me at all times. At 11, I was given a full colostomy and I truly believe I wouldn’t probably have been here if it weren’t for the all the doctors that I’ve had leading up to the full colostomy. At the age of 12 life took a darker turn as I suffered from depression and decided that I wanted to take my own life; I attempted jumping off a balcony while on holiday. This was all due to my being bullied at school. I was given medication to treat the depression which didn’t work if anything this made me worse. At around the same age I was told about a local performing arts La Danse Fantastique, that is where discovered that I belonged to perform on stage. The positive side of performing helped my depression so much I can see that now. Since being with La Danse Fantastique I have been able to achieve exams I am very proud of. I never would have got exams in anything else. I have grades in ISTD dance in tap, jazz modern and ballet and I am currently up to intermediate standard, also LAMDA/Trinity Guildhall grades in drama and musical theatre. I went onto study performing arts at college after a essential skills course. I gained a BTEC 1st and BTEC National diplomas. I have singing lessons with my singing teacher Maggie Roberts and through this I’ve been able to perform at the famous Circus Tavern in Purfleet. In 2012 when I found the arts and my depression took a turn for the better I was nominated by my local dance teacher for the Pride of Essex Award which I was lucky to receive. Through my dance teacher again In 2013 I was introduced to Gateway 97.8, a radio station based in Basildon, Essex where I’m currently a daytime presenter for them. In 2015 like my older brother before me I was honoured to receive The Diana Award for volunteering. In the same year I was introduced to the charity Anna Kennedy Online which raises awareness in the autism world. I was lucky to perform at their annual Autism’s Got Talent event in that year I was then made an ambassador of the charity which makes me super proud. I was honoured to receive The Diana Award for volunteering. Credit: Diana Award. In the same year I was given a scholarship with Pineapple Performing Arts in Covent Garden London where I attend on Sundays. 2016 was yet another amazing year where I was so proud to have received the National Diversity Award for Positive Role Model in the Disability section. In 2018 I have done a skydive for a local lad who has dystonia, autism and cerebral palsy and raised funds for him to have electric adaptations for his wheelchair to give some independence. Also in the same year I was honoured to have performed at the famous Royal Albert Hall alongside everyone from La Danse Fantastique. I am also behind the July 4th 2018 day held in my home town of Basildon. In collaboration with training2care autism reality buses we invited over 100 emergency services to an autism awareness day. I feel super proud that I helped put this together as I feel all emergency services should understand autism as best they can. I also have (with the help of my parents now called ‘Team Avery Essex’), formed Aston’s Pamper Project. My local fundraising helps to pay for local Essex people selected by judges for their charitable work or if they are living with disability or hardship or those that have gone the extra mile to go to a salon and have a makeover. This was previously held at Twinz salon, and we are now looking to offer this experience in more places. This is paid for entirely by special sponsorship and fundraising. 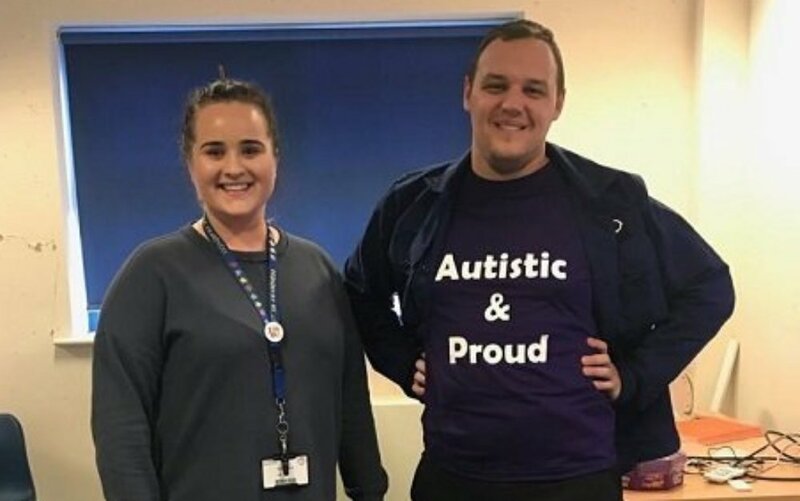 My favourite achievement to date is that recently I have started to go into schools and do a positive talk for the children and parents and teachers, this is so that they can understand and I hope raise awareness of autism, I want them to see that being diagnosed with autism and other disabilities does not mean the its the end of the road. During the talk I show them a video about my life of the ups and downs, and my parents describe my early years. The video is sung by the Averyettes (Jessica Richardson, Skye Stack. Latalia Pickleman, Sophie Griffiths and Rebecca Stanford). They see the video and some of the the hard times and then they see me now. Aston Avery is a young man who has overcome a great deal in his young life. Aged 21, he was was diagnosed with autism at just two and a half.